This piece is an except from a new report on the Great Lakes Region for the Sagamore Institue. Download the pdf version for the full report including charts and maps on the region. The American Great Lakes region has long been a region defined by the forces of production, both agricultural and industrial. From the 1840s on, the region forged a legacy of productive power, easily surpassing the old northeast as the primary center of American industrial and agricultural might. Natural forces shaped the region, from its waterways and mineral resources, which made it ideal for industrial development. The lakes themselves are the largest sources of freshwater on the planet; the five lakes together are twice the size of England. This “fresh water Mediterranean” provided an essential pathway for transport between the various regions of the Great Lakes, as well as a connection to the northeast and, through the Saint Lawrence and the Erie Canal, to New York and the Atlantic. But more than anything, it has been the people of the Great Lakes that proved its greatest resource. In the early 19th Century, the region’s development was paced by migrants from New England, who brought with them their values of thrift, hard work and a passion for education and self-improvement. Later others, notably Germans and Scandinavians, injected a similar culture of self-improvement to the area. Like New England, the Great Lakes, noted author John Gunther, was possessed with a “gadget mind” that sparked the innovations that gave America command of the industrial revolution. Much of the brawn for this came from the poorer parts of Europe --- Russia, Italy, and most particularly Poland, which led one observer to call Chicago “a mushroom and a suburb of Warsaw.” By 1920 one third of third of the population of Chicago, Cleveland and Detroit was foreign born. Initially based largely on agricultural exports, by 1860 the region had blossomed into an urbanized industrial powerhouse. “All over the Middle West,” wrote historians Charles and Mary Beard, “crossroads hamlets grew into trading towns, villages spread into cities, cities became railway and industrial centers.” The area’s rapid growth sparked great optimism; in 1841 journalist and land speculator predicted that by 1940 Cincinnati would be the largest city in North America and by 2000 “the greatest city in the world.” Cleveland, Cincinnati, Toledo, Milwaukee and most of all Chicago stood at the center of a “web of steel” that marked the region as the world’s preeminent industrial center. It also sparked other innovations, from the auto assembly line and the high-rise building to the mail order catalog. This growth cascaded in the early years of the last century. It became the nation’s primary growth engine. Between 1900 and 1920 Chicago added a million people while Cleveland doubled its population and Detroit, epicenter of the emerging “automobile revolution”, grew three fold. In everything from architecture and city planning to literature, the Great Lakes stood at the national, even global, cutting edge. By the 1970s, the Great Lakes region, including Ontario, accounted for two-thirds of the North America’s automobile production, 70 percent of pig iron and three quarters of its steel. Yet by that time, this close tie to industry was seen not as an advantage but as a curse, driving the region towards precipitous decline. Once a magnet for newcomers, the region now took a back seat as a place that attracted domestic or foreign migrants.10 With the exception of Chicago, the Lakes region have continues to lag both in domestic migration and foreign immigrants. Newcomers were reinventing places like Los Angeles, Houston, Miami and New York, but relatively few were coming to Cleveland, Detroit or Cincinnati. Until recently there has been ample reason to believe this decline would continue. Only nine of the Midwest’s 40 largest metropolitan areas have a higher per capita GDP than the national average. This reflected a deep seated loss of jobs paced by industrial decline but not made up for by gains in other fields. During this period the region not only lost many of its industrial jobs but, more pointedly, failed to replace them with the technology and service jobs that grew rapidly elsewhere. As a result, the region’s percentage of the national workforce dropped steadily over the past half century. In 1966, the Great Lakes region possessed one in four jobs in the country; by 2010 that percentage had fallen to less than one in five. As a response to the perception of industry-led decline, some Great Lakes leaders sought out other sources of employment and growth. In Detroit, for example, much emphasis was placed on casino development. Michigan’s former Governor Jennifer Granholm, sought to reverse decline by targeting the so-called “creative class” by turning its hard-hit towns into “cool cities.” Across the region, others focused on convention centers, arts attractions such as museums and other entertainment venues as the way to improve their sagging fortunes. Should Akron start putting more money in skateparks or global warming? There are huge problems in spending money in order to attract the geographically fickle. Fads fade and the mobile – largely people under 30 – will move again...Tying up the urban budget with projects aimed at retaining the creative class has its own perils. There is little, if any, evidence indicating that this policy will decrease the geographic mobility of the well-educated. Many cities stuffed with cultural amenities also sport high rates of out-migration. Furthermore, tastes change. “Best places to live” lists change quite a bit from one year to the next. Instead, the region’s current rebound is occurring in surprising fashion. The real lure of the Great Lakes lies in its own fundamental advantages: lower housing prices, business climate and perhaps, more importantly, a nascent industrial rebound. This can be seen, most importantly, in employment numbers. Starting in the last few years, the area’s share of jobs has remained steady. The highest unemployment rates in the country are no longer concentrated in the Great Lakes region, but in states such as California and Nevada. In many Great Lakes states, unemployment rates have been dropping more rapidly than the national average. Critically this resurgence has not resulted in a shift away from industrial growth. Instead, we are witnessing the early stages of what could be a profound increase in both the economic heft and job creation tied to the industrial sector. But the Great Lakes rebound is not merely a cyclical, one dimensional rise; it also includes growth in a host of other sectors, including in the information area and, perhaps even more remarkably, in energy, particularly shale gas. At the same time the rise in non-industrial jobs also should testify to the growing attractiveness of the region, particularly for young families. After decades of mass outmigration, the region has begun to achieve a more favorable balance with the rest of country. Outmigration rates for states in the region are at or below national levels. Migration in the Midwest, as Russell and others have pointed out, should be regarded more from the vantage point of recruitment, not retention. By promoting its affordability and improving economy, the region could improve its trailing inmigration rates. As people vote with their feet for the region, they are laying down the foundation for the area’s resurgence in the coming decades. The Great Lakes demographic and economic turnaround does not mean that growth has occurred in the pattern of the early 20th Century. Instead we see the emergence of a new set of leadership cities. If Akron, Detroit, Cleveland and Chicago paced the region’s early 20th century ascendency, the new “winners” appear to include affordable, attractive cities, many of whom are home to major universities, state capitals and key research institutions. These areas have done well in attracting many people from the less successful metropolitan areas of the region. Columbus, for example, evidenced strong growth from the rest of Ohio and other parts of the Midwest, notably Michigan and Illinois. But perhaps more importantly, the area enjoys strong in-migration from those parts of country -- notably the Northeast and California -- that have traditionally dominated knowledge-intensive industries. A similar pattern can be seen in Indianapolis. In recent years, as urban analyst Aaron Renn notes, the Indiana capital has enjoyed “a profile closer to the Sun Belt than the Rust Belt.” It grew its population at a rate 50 percent greater than the national average, and also had strong net inmigration, with almost 65,000 net people deciding to pack up and move to the Indiana capital. Already a center of regional culture and services, the area has succeeded as well in attracting new migrants not only from big Midwestern cities such as Chicago, but also from the two coasts. By way of contrast, Chicago’s migration patterns look much different than those in Columbus and Indianapolis. Many other regions around the country benefited from people leaving the Windy City than Chicago gained from them. Chicago’s biggest gains have come from other, more troubled Great Lakes regions, while Indianapolis, for instance, has taken advantage of Chicagoans looking for more opportunity elsewhere. Behind this shift in migration from the coasts lie many factors, such as taxes and regulations. But perhaps most important may be the region’s greater affordability. Even after the bubble, for example, many key eastern and west coast regions suffer a ratio housing prices to annual incomes of five, six or even seven to one. For the most part, virtually all parts of the Great Lakes have ratios of three or less. Over time, this could prove a critical advantage to the Great Lakes. As the current millennial generation – the largest generation in American history – enters their 30s, it is likely that they will seek out places where they can afford to buy a home and enjoy a middle class quality of life. The Great Lakes will be one place that can offer that opportunity. The future of the Great Lakes region lies neither in simply the “information” economy nor in the brute force of manufacturing. Instead it is as a result of a combination both of the industrial sector and the high-value service sectors that feed into it. Critically, the region boasts many areas where the information and service economies are particularly strong. Of the nine Midwestern metropolitan areas with per capita GDP growth above the national average, four are capital cities and six are home to major universities. Given governmental involvement in two of the fastest-growing sectors of the economy, health care and education, it is no surprise that seats of government and large state-funded research universities – which also double as the hotbeds of medical services – are growing ahead of other regions with a more traditional, and perhaps outdated, economic base. Indeed, some Midwestern areas are outperforming the coastal economies even in the realm of high-tech. In a recent ranking by Forbes magazine of best areas for tech growth among the nation’s 51 largest metropolitan areas, the region boasted three of the top fifteen areas, led by #3 Columbus, followed by Indianapolis and St. Louis. 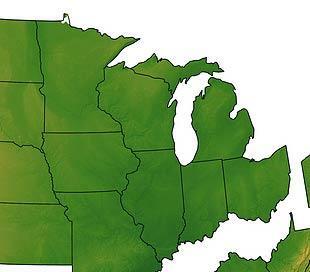 However, it would be inaccurate to portray the Midwest as depending purely on a service or information economy. Producing things for sale and export is still alive and well, and the Midwestern regions that have blended their traditional capacity for manufacturing with newer fast-growing sectors of the economy. Cedar Rapids, Iowa enjoyed the highest rate of GDP growth from 2001-2010 of any metropolitan area in the Midwest. Between Cedar Rapids and Iowa City, home to the University of Iowa, a new high-tech corridor has grown up that takes advantage of the area’s historical manufacturing capacity and the new technology driven through the university. Terre Haute, Indiana, fifth on the list of GDP leaders, reflects even more completely the blending of the “old” Midwest with the emerging one. Manufacturing has held steady as a share of the local economy at about 15.5 percent since 1991, but health and education have jumped from 14 to 17 percent, while wholesale services and agriculture have dropped. Terre Haute is home to Indiana State University and Rose-Hulman Institute of Technology, a regional leader in engineering, science, and mathematics education. Peoria, Illinois is second behind Cedar Rapids in GDP growth the past ten years. It is home to more than 200 manufacturing firms, two of the world’s largest earth-moving equipment makers, and coal fields. Peoria is also a leader in college degree attainment in the Great Lakes. While its absolute attainment levels are still low, its college educated population is growing faster than nearly every community in the Midwest. Peoria is one example of how brains + brawn, and not just brains, is the key to Midwestern growth going forward. Consider what we might call the dynamic of the Badgers and the Wolverines. In Wisconsin, home of the Badgers, there exists an east-west corridor between Madison, home to the state university and state capital, and Milwaukee, the state’s historical center of industry and commerce. In Michigan, home of the Wolverines, an east-west corridor stretches between Ann Arbor, home to the University of Michigan, and Detroit, the state’s historical center of industry and commerce. In Figure 14 we see that both Ann Arbor and Madison have high levels of bachelor degrees compared to the national average. But Madison is leading the Midwest in bachelor degree growth while Ann Arbor rate remains fairly static. Meanwhile, even though Detroit surprises with a fairly high rate of bachelor degree growth, Milwaukee stays in front of the national average in both growth and absolute numbers of college-educated workers. Some might say that the Badgers are beating the Wolverines in the knowledge-intensive sectors of the economy, but that the lead manufacturing is up for grabs. But the truth is that the Wisconsin corridor also enjoys positive marks in manufacturing. Milwaukee, for example, leads Detroit in the growth of manufacturing jobs. And Madison is emerging as a manufacturing center while Ann Arbor lags far behind. The knowledge economy and the old-time manufacturing economy can work happily together, in the case of Madison Milwaukee, or so far less so in the case of Ann Arbor-Detroit. Despite the attempts to write it off as a spent force, manufacturing will remain a key driver of Midwestern and national growth. Despite the many job losses that impacted this sector over the past generation, American manufacturing remains remarkably resilient, with a global market share similar to that of the 1970s. More recently, however, American industrial base has begun to expand and begin to gain on its competitors. This places the Great Lakes in an advantageous position. American manufacturing after a decade of decline has outpaced the overall recovery over the two years, in part due to soaring exports. In 2011 American manufacturing continued to expand even as Germany, Japan and Brazil all weakened in this vital sector. It also leads to the prospect that as coal-fired plants become more expensive to operate due to concerns over greenhouse gas emissions, the region will have a new, cleaner and potentially less expensive power source. Another critical factor has been the rise of wage rates in both Europe and East Asia. Increasingly, American-based manufacturing is in a favored position as a lower cost producer. Concerns over “knock offs” and lack of patent protection in China may also be sparking a “back to USA” trend, something particularly favorable to the Great Lakes region. Yet the new industrial base will not resemble old one. We are seeing both an industrial renaissance in the country and one that is heavily concentrated in the Great Lakes region. But it is a resurgence that is as much brain as brawn; an industry increasingly dependent not just on hard work, but skilled labor. This pattern cuts across industry lines. Indeed even as the share of the workforce employed in manufacturing has dropped from 20 percent to roughly half that, high skilled jobs in industry have soared 37 percent. Even after years of declining employment, manufacturers in heavy industry, such as automobiles, are running short on skilled workers. Industry expert David Cole predicts there could be demand for 100,000 new workers by 2013. Overall, 83 percent of all manufacturers, according to Deloitte Touche, suffer a moderate or severe shortage of skilled production workers. This remains a fundamental strength of the region. Much of the skilled labor base in the nation remains in the Midwest. The region is also home to four of the highest ranked, according to US News, industrial engineering schools in the nation: the University of Michigan at Ann Arbor, Northwestern, the University of Wisconsin at Madison and Purdue. For now the very culture of production – often seen as a liability in the past – could prove a key to the Great Lakes’ future resurgence. These advantages are already redounding to the region. Indeed a recent Forbes survey of “heavy metal” industries – that is those involved heavy industry, metals, vehicles and complex machinery – found the region in surprisingly good shape. The Milwaukee area, for example, ranked number 2 among the 50 metropolitan areas on the list, while Detroit clocked in with a respectable 6 placed finish. Cincinnati, Kansas City and Cleveland all ranked well within the top 20. In all, the 40 Great Lakes metropolitan areas added 50,000 heavy metal industry jobs since 2009. For the first time in a generation, the Great Lakes are experiencing demographic and economic trends in their favor. Yet in everything from migration to industrial growth, the region can expect to face strong competition from other areas, most notably Texas, the Southeast, the Great Plains and the Intermountain West for new jobs and production. To meet this challenge, and truly take advantage of improved conditions, the region must develop a strategy that is suited to its particular advantages. There is no need to try to compete with Manhattan on urban chic, with Silicon Valley in high-tech startups or with Hollywood in entertainment – as some growth theorists would likely recommend. The Great Lakes needs to focus primarily on those very values of production and community that sparked its original ascendance. Once these are identified and strengthened, the region can once again not only rebound, but define its own space in the national and global economy. Perhaps the first priority has to do with education. The Great Lakes has an enormous edge in terms of first-class engineering schools, and needs to become more focused on these programs and those associated with them, including the information sciences. It needs to supplement this focus on the top echelon with a greater effort -- as we can now see in Ohio -- in training more of the skilled workforce desperately needed for the region’s resurgent manufacturers. By 2018, 63 percent of the nation’s jobs will require some type of post-high school training credential. Increasingly successful education programs have to focus on aligning with jobs available within a state or region. This can only occur with explicit cooperation between education, government, and the business community. Likewise, business collaboration with universities can boost the amount and the impact of industry R&D investments that fosters innovation. University-based research and technology development can yield fast-growing, high-technology firms that create higher-paying middle skill and professional, scientific and technical jobs. The second priority lies in developing critical infrastructure to keep the region’s economy humming. This includes a greater emphasis on developing energy resources, rebuilding and modernizing the freight rail, waterways and ports, as well as highways that connect the Great Lakes to the rest of the country and the world. In the modern economy, creating economic advantage also includes paying attention to specialized infrastructure such as university and lab facilities, technology and training centers, multi-modal shipping and logistics facilities, and research parks. These infrasystems – integrated fusions of facilities, technology and advanced socio-technical capabilities – can drive innovation, particularly for future higher-value industries and higher-paying jobs. The full range of today’s infrastructure assets is shown in the figure below. Third, and perhaps most important, the region needs to maintain the housing affordability and other quality of life attributes critical to attracting both immigrants and domestic migrants. As Millennials enter their 30s in large numbers over the next decade, the region needs to improve its public schools, parks and other amenities to attract them. Ultimately, this represents a distinctly common-sense means to overcome a legacy of failure and create a new paradigm of success for the region. The Great Lakes, rather than trying to arrest its decline by completely running away from its past, can now recover the great sense of potential so evident in its heroic history. Download the full pdf version of the report, including charts and maps about the Great Lakes Region. The report was authored for the Sagamore Institute with support from the Lynde and Harry Bradley Foundation. Ryan Streeter is Distinguished Fellow for Economic and Fiscal Policy at the Sagamore Institute. You can follow his work at RyanStreeter.com and Sagamoreinstitute.org.